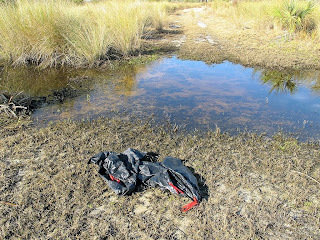 Throughout my hikes during the winter of 2009-2010, it seemed I continually encountered water in my part of Florida. Wetlands seemed to appear where they had not existed before. I mean the fields had water in them, the woods had water in them and the small manmade canals had not only water but also muck to cross. Regarding the muck, it was so bad at times I thought I was going to get stuck for life – ugh! I normally hike in breathable hiking boots to minimize the heat retained in a heavier boot (heat = blisters). The wet areas became such a hassle/hazard; I decided to invest in a pair of good gore-tex hiking boots to keep my feet dry in areas of shallow standing water. The gore-tex boots worked very well until a manufacturing flaw was encountered and they began to leak. I just don’t’ like wet feet, for many reasons (trench foot being the worst case scenario). Once I had the flawed boots replace, they did the trick for the standing water, but were useless when I encountered water that was over boot level. Many times I elected to turn around and give up on a trail. I hate to give up, so I started looking for something light I could carry which would get me through knee deep water. My first attempts centered on plastic garbage bags. I went out and purchased some “flex” white ones – no luck, they just tore. I then tried “flex” black garbage bags, again no luck. My next attempt was 3-mil heavy weight black garbage bag – those worked pretty well and did the trick at least for a few “fords”. As I said, they “worked”, but just barely! If I had to trudge for a while they would spring a leak and I would feel that cold water rising in my socks. They also where somewhat cumbersome to carry after use – bulky! My pursuit continued for a solution to ford the high water into the summer months. While channel surfing I came across a TV show about Alaska and I noticed a fellow pull a pair of boots out of his pack, slip them over his hiking boots and ford a stream – finally my solution! Using the Internet I found a company in Colorado that sold such a boot – Wiggy’s. I immediately ordered a pair – I had to have dry feet! 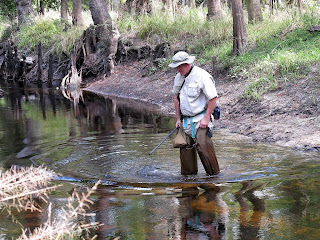 Since receiving my “lightweight waders” I have used them a few times to cross small creeks and rivers, as well as trek through some pretty mucky areas. All you do is pull them out of your pack, slip them right on over your hiking boots and your ready! I have even shared them with hiking companions – after I cross, I pack them back in their sack, insert a water bottle in the sack for weight and toss them back across the stream to my friend. What a great feeling not to have to waste time hunting for logs or less wet / mucky areas to cross. The ease of sliding these on, to trek across the wet area and not having my course interrupted is immeasurable. They are extremely lightweight, dry quickly and re-pack into their compact carrying sack with ease. After using them, I carry them out for a while to dry, and then put them into the sack provided for use again if needed. When I return home, after a thorough washing with a garden hose, and some time spent drying in the sun, they are ready to be stored until the next trip. 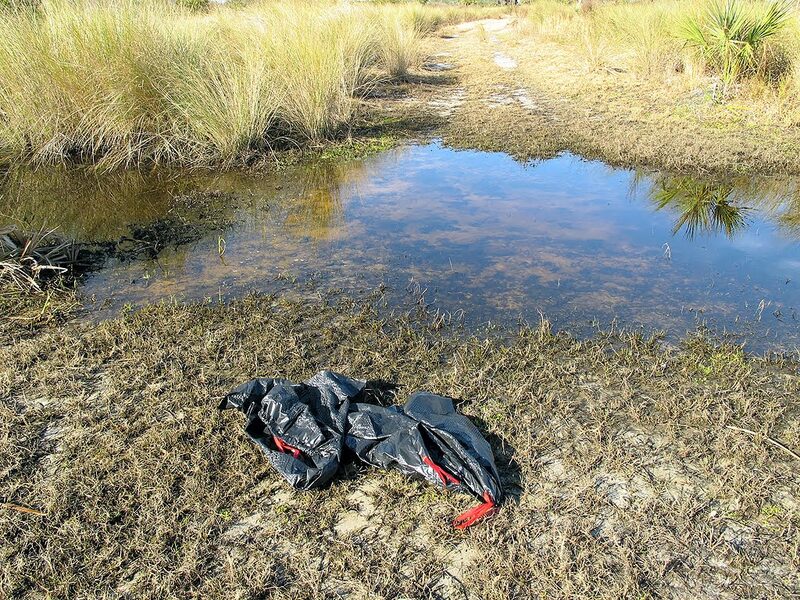 As of summer of 2011, I can no longer recommend Wiggy’s lightweight waders for rougher area use, fine still to cross small water areas. They are not made for heavy-duty use, just short water/muck crossings. I was out GEOcaching and I encountered water on the trail. I pulled out my Wiggy boots and put them on. Well, there most have been a sharp twig in the water, as before I knew it I had a major slit in one boot and I had a very wet foot. I repaired the slit when I got home, but I didn't want that experience again so I went back to the Internet to look for other options. I found another company which makes boots which can be put on over hiking boots, that company is "NEOS". They call their line "overshoes", consisting of a river version and a trekker version. I purchased both of them because each has a different purpose. Both have a very good soles, tough rubber. The problem with both of them are that they are a little heavier and bulkier than the "wiggly" boots. I would try carrying the river version if I think I am going to encounter deep water, as they come up to the hip. The trekker version only comes up to the knee, but they do fit in my backpack very well, so those are the ones I carry if I expect some water. I did have to buy some bags to carry the NEOS in as they do not come with bags. 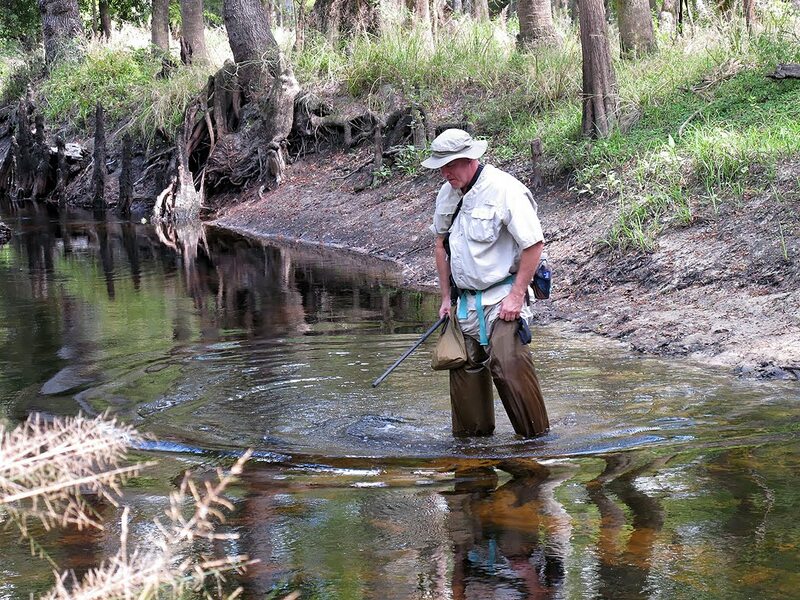 Wiggy Light Weight Waders - very light weight, easy to carry and put on. The problem is that they are not that durable so you have to be careful. NEOS River Trekker Overshoe - very durable, but heavy. Good, solid sole. I feel they will allow you to cut through some minor brush. NEOS Trekker Overshoe - very durable, solid sole. They can be backpacked with little problems. These are the ones I now carry into wet areas. I'm sure there other options out there If you know of any, let me know. In conclusion, some people can tolerate wet feet; but not me. When the going gets wet I now have my gore-tex hiking boots and "overshoes" to protect me from the ugly feeling (also, trench foot and blisters) of wet feet! It's more stuff to carry and takes more time but how about the Wiggy's waders with a pair of cheap Croc knock-offs or other overshoe? We took a hike out at Tosohatchee today and one of our party had the short version of the Neos. I believe this was only the 2nd of 3rd time using them and they leaked. I just discovered your site so this will take me quite a while to dig through all the good information. Wet feet are wet feet; I have had them many times. I just was out in Tosohatchee and hit water where I didn’t expect it – up on the old railroad berm. I figured I didn’t need the boots or the extra weight so I didn’t have any with me. Needless to say, after trying to jump water a couple of times I had wet, cold feet – ugh! I don’t think there is any “silver bullet” as far as boots go. The Wiggys are really only good for crossing streams, I used them on a wet trail one day and a stick punctured a hole in them. They must go over boots, they have no firm bottom. The Croc idea has merit, so think about that. As far as the Neos, they have saved me at times, but at other times I got into mud and they just pulled off. I did buy some Velcro bands to put around them to keep them on. Like the Wiggys, they go over your hiking boots. I carry a lightweight hiking stool to sit on to put the boots on and take them off (I carry it all the time, so it is not extra weight). So bottom line, is the pain worth the gain?